Buy African Cichlid fish for sale from Lake Malawi, Tangyanika, and Victoria online. All of our freshwater cichlids for sale are quarantined and fed the finest foods such as New Life Spectrum, Hikari frozen foods like Mysis and Bloodworms, and fresh Spirulina flakes. Select among the finest hand picked strains bred directly by us or from cichlid breeders in Arizona, California, and Nevada. Impress your friends with the quality of your new fish. 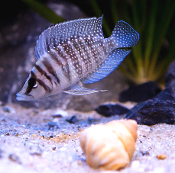 Check out our Cichlid Breeding Guide and learn how to breed Altolamprologus leleupi, frontosa, calvus, haplochromis, peacocks, shell dwellers and more. See the BreedCichlids.com difference! Local breeders practice better husbandry skills than any mass producing tropical fish farm. The fish we sell are healthier and have better genetics than your typical strains sold at big chain pet stores. One flat rate shipping price for as many fish as you want! As always no box charges, no packing charges, or cool/heat pack charges ever! Live Arrival Guarantee, we will replace your fish free of charge! Simply send us a picture of the fish inside the unopened bag within 3 hours of delivery and we will either issue store credit or replace your fish at our expense. Pay in confidence, Paypal and all major credit cards accepted. See our terms and conditions page for more details. Mdoka White Lips Neolamprologus multifasciatus Cyprichromis leptosoma "mpulungu"
Can't find the african cichlid you're looking for? Please send us a message from our Contact US page and we can check our affliate local breeders, and direct importers for the exact species and size you are looking for. We have access to many exotic african cichlids and other live freshwater tropical fish that are not kept in our real time inventory. 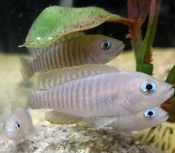 Buy mbuna, peacocks, malawi cichlids, frontosa cichlids, calvus, compressiceps, and many other live african cichlids for sale online through special order. Buy African cichlids from breedcichlids.com and see the difference!